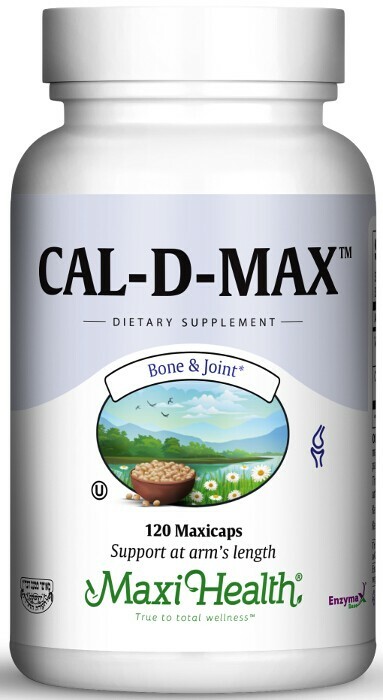 Maxi Health Research® has combined a fine balance of calcium carbonate, malate, and citrate and if you have been looking for a calcium supplement with vitamin D3, Cal-D-Max™ capsules has that too. Cal-D-Max™ uses vitamin D3 (as cholecalciferol) which is the same thing you would get from sitting out in the sun. It’s the most usable form for your body. For many people adequate sunshine is no longer an option. With the busy indoor schedules, requirements of religious dress, and vulnerability to skin problems, supplementation is fast becoming the method of choice for adequate vitamin D intake worldwide. Make taking Cal-D Max™ capsules a regular part of yours and family’s diet! Take two (2) Maxicaps™ in the morning and two (2) Maxicaps™ in the evening with meals, or as directed. This product contains no wheat, salt, milk, yeast, gluten, artificial flavors, colorings or preservatives.